The Official Update of Gugma sa Kabataan, Inc. The six men of Hindustan were very eager to see the elephant (though they were blind). The first happened to fall against the broad and sturdy and shouted the elephant is like a wall. The second feeling of the tusk shouted “what have we here the elephant is like a spear; the third happened to take the squirming trunk within his hands and spoke “the elephant is like a snake. The fourth reached his eager hand and felt about the knee “the elephant is like a tree. The fifth that chanced to touch the ear “the elephant is like a fan. Finally the six seized on the swinging tail and shouted “the elephant is very like a rope. Oftentimes we are like the six blind men with biases and stereotyped attitude. Our education was indoctrinated by our families and communities we belong – neighbors, church, school, government. It was instilled in us that children on the street can not be trusted because they are addict, uncontrollable and violent. They have no moral values and so on. They are exploited as car washers and car watchers the fee is so meager just enough for one square meal a day. We rather give our left over food to them (that dogs would not even bother to smell) than put it in rubbish. asked and request for what she needs. This season of Lent, is a season to repent. Let us examine ourselves, our spirituality on how we relate with the whole creation of God particularly the boys and girls on the street. Like us they were created in the image of God. Thomas of Aquinas reminded us when he said “believe and you will be able to understand.” Yes, we got to believe that even in their dirty looks and stinky smells children in their being is an IMAGO DEI. Arnel, Francis, Ricky and Rhoda Mae have demonstrated it. to obtain a normal life and become responsible persons. formal and in alternative school. Lupeba was elected President of GsK Inc. The board of incorporators vouched for the leadership and voted Nora M. Lupeba as president of the Board of Trustees. Ms. Lupeba was formerly a volunteer accountant at Balay sa Gugma, Inc. By profession she is a certified public accountant and works for the government as the Chief Financial Administrator in the Department of Trade and Industry. Other members of the Boards elected are: Dr. Stefan Wolfesntetter-Vice-president; Ms. Joanna Rose R. Burgos-Secretary; Ms. Flordeliza Q. Navales- Treasurer; Ms. Ma. Esperanza V. Trillo- Auditor; Engr. Mitchell L. Flores-financial Secretary; Misses Jillian cooper and Aurora H. Tagalog, Mr. James Robert Messick- members. Ms. 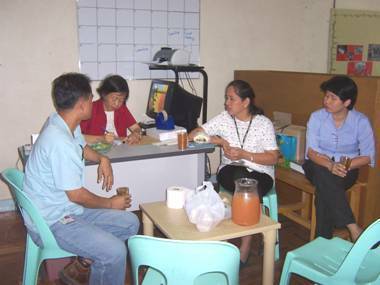 Faith Gerona, Social Worker Officer and Mr. Sofonias Vidal, Jr, Street Educator of Cagayan de Oro DSWD visited the Center in March 2, 2005. 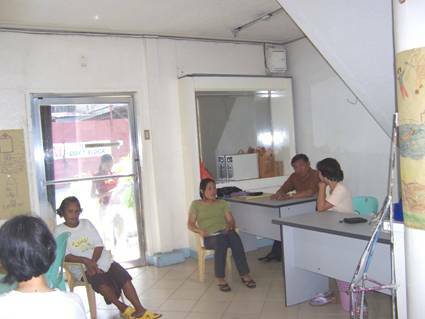 The visitation established bonding to be partners in reaching out the street children and in the sharing of human resources. The dialogue meeting explored into the possibility of organizing the street children according to their interest and needs. Children in the center and in jail were motivated to make cards. The card making allows the children to express the gift in art. To the children in Lumbia city jail card making facilitates to cope in their loneliness, anxieties and depression moments. Picture E “What matters most is the interest in making card.” Ricky, Arnold, Albert and Avin don’t feel the uncomfort of making card on the floor. From scraps of cogon grass paper, dried banana fiber and local dried flowers children can make their imaginations wild and create a beautiful card. “Build your Tower . . . .
Self disclosure was part of the Saturday meeting in January 30, 2005. The children were asked to build a tower as an exercise in team building. 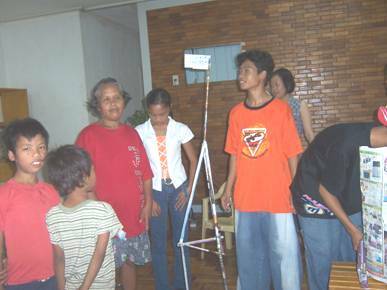 The group of Williamar Punlaon produced the tallest, strongest and unique tower. It is very interesting that children noted that cooperation, division of work, and planning are important in team building. Also, the presence of an adult was recognized as vital in team building. “The wisdom of the old” commented by the group is needed for guidance. 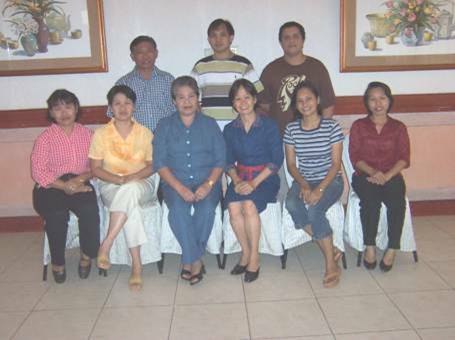 On February 12, 2005, parents/guardians were invited for a Consultation meeting. The goal of the meeting was to strengthen the partnership relationship between the family and the organization. It was agreed that a quarterly meeting will be facilitated by the center to discuss matters on family, academic and behavior of the children. Ms. Flordeliza Q. Navales, GsK Treasurer and a psychologist by profession was very helpful giving in-put to the psychological needs of the children. The management of Dunkin Donut and Carmelite Sisters in Cagayan de Oro committed to a weekly support GsK program. Every Tuesday our children are beneficiaries of fresh eggs from the Carmelite Sisters. Likewise, doughnuts from Dunkin are shared to children both on the street and in jail. Kendrick is very reserved boy. His mind and his hand can be very wild to draw and to cut with a wondrous design. As a sophomore student in the secondary school, his teacher recognized and affirmed his ability in art. It was poverty that had pushed Kendrick de la Cruz on street life. As a plastic bag vendor he was exposed to the danger on the street life. There was freedom from family discipline, belonging among street children and immediate income that motivated Kendrick to run away from home. Tata as he is fondly called had his feet chained by his parents to keep him from going away. His determination to be on the street with other children was stronger than the chain. 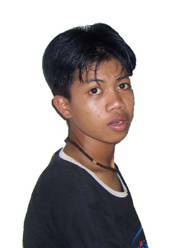 One day he was brought to the center of Balay sa Gugma by a concerned citizen.